Yesterday I stopped by Stonewood Center, which was hosting approximately eight gourmet food trucks all day. 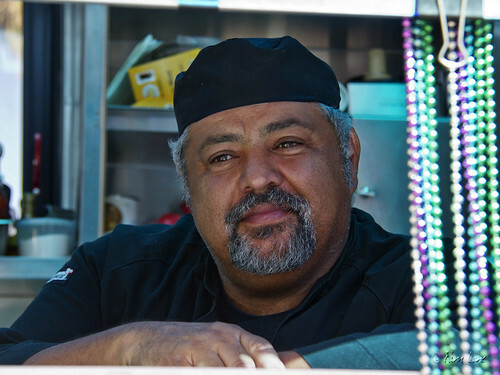 My favorite was the Crazy Creole Cafe, owned by Guy "Crazy Creole" DuPlantier III, above. Guy is a New Orleans native, who literally dreamed up his jambalaya recipe one night. Guy let me sample his gourmet options (ah, the perks of writing a blog! 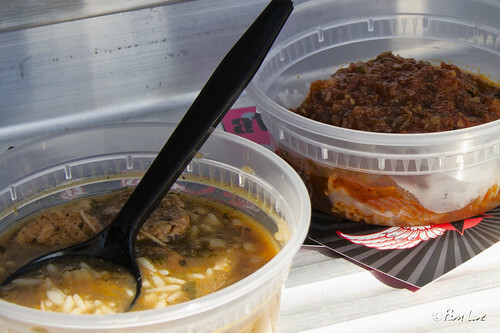 ), which included his Gumbo Ya Ya (on the left), Seafood Gumbo (on the right), Jambalaya, Red Beans and Rice, and Shrimp Gumbo. I'm a somewhat picky eater, and this was a little out of my food comfort zone, so I was pleasantly surprised to find that I really liked that Gumbo Ya Ya. And my daughter heartily approved of all the rest of them. Nice portrait, and nice posting.